Germany has had enough of American foreign policy. Angela Merkel’s visits to Russia and China are a testament to that. 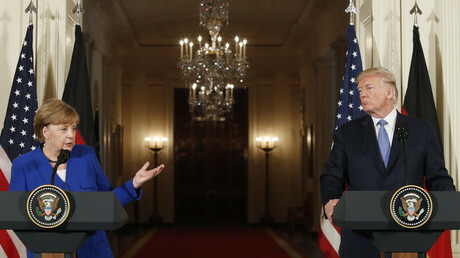 The comments were, of course, a direct reference to US President Donald Trump’s ludicrous but anticipated decision to completely nuke the Iranian nuclear accord, also known as the Joint Comprehensive Plan of Action (JCPOA). “It is no longer such that the United States simply protects us, but Europe must take its destiny in its own hands. That’s the task of the future,” Merkel reportedly said during a speech honoring French President Emmanuel Macron. In the weeks since, Merkel has certainly proved that this was no idle threat. The German chancellor has made trips to both Russia and China, and the outcomes of those meetings appear to suggest a complete restructuring of the balance of power in Europe and Asia respectively. Just this Thursday, China has already said it would“open its door wider” to German businesses after giving Merkel a warm reception. Both China and Germany have a common interest in defeating Trump’s plan to kill trade surpluses that countries have with the United States, as they are both equally affected by Trump’s threats. Each time Trump opens his mouth, it seems that European and Asian businesses are instantly affected. Germany is the largest auto exporter to the US out of any European country, and is China’s biggest European trading partner which was worth $179 billion just last year alone. 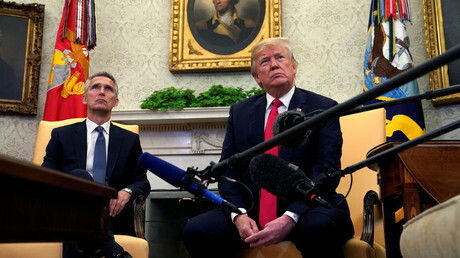 It is not clear if the Trump administration is that incompetent or if this is done on purpose, in full knowledge that its actions will only further isolate the United States on the world stage and push states that previously held more adversarial positions closer and closer together. If it is done on purpose, one has to wonder what sort of mindset is behind the leadership which is on a self-destruct mission, and how it expects to maintain its worldwide empire, all the while irking its traditional allies. It is quite clear that Trump’s decision to axe the Iran deal will onlypave the way for China to take advantage of the financial opportunities flowing out of Iran if sanctions present a buffer to German interests. China has already been assisting Iran to out-maneuver US-led sanctions through, for example, the use of credit lines using the Yuan. In that context, does Donald Trump want to contain China or empower it? You can only go so far serving the interests of Saudi Arabia and Israel while ignoring strong European states who would rather ink financial deals than turn Iran into a glass crater, a strong point of difference between Merkel and say, newly appointed US national security adviser John Bolton. The lifting of sanctions on Iran already led to an increase in trade between Germany and Iran from €2.7 billion in 2014 to €3.5 billion last year. It is also worth noting that Iran will now start accepting euros for its oil in an attempt to not only avoid the US dollar, but in a move that will directly threaten it. This topic is probably best suited for another article, but it is definitely something worth keeping an eye on – and will most likely only bolster Germany’s resolve to protect Iran. Either way, Germany and China have both agreed to stick to the Iran deal. Think for a second what this means: John Bolton openly warned European companies and countries against continuing business with Iran, stating that they could be targeted by sanctions. The newly appointed ambassador to Germany, Richard Grenell, also immediately warnedGermany directly that German companies must halt their business activities with Tehran or face sanctions. The German-Chinese announcement also came just after Iran’s leader, Ayatollah Khamenei, issued a set of demands of its own, stating that the Europeans also could not be trusted. Germany and China have essentially given the US the political middle finger in response, and arguably kowtowed to Iranian interests instead. Not too long ago, the US alsowarned Germany that sanctions may also target the German-Russia pipeline known as the Nord Stream 2 Project. If you ever needed proof that the underlying reasons for US-led wars were driven by money and natural gas, this is it. Why prevent Germany and Russia from working on this monumental project? Germany needs the gas, and Russia, relatively close-by, can supply it. Despite the fact that the two countries continue to hold anumber of disputes (including sanctions that continue to target Russia), Merkel’s meeting with Russian President Vladimir Putin demonstrates that it is still possible to meet with one’s counterpart and discuss those issues amicably, an idea that seems almost completely lost on the current Trump administration. 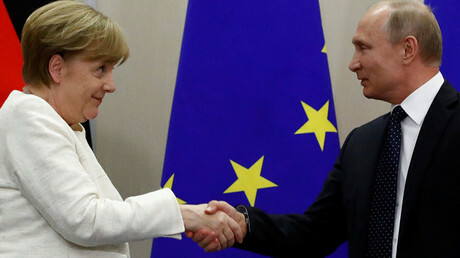 “If you want to solve problems, you have to talk to each other,” Merkel said alongside Putin midway through the talks. According to a senior German official with knowledge of the chancellery’s strategy, rapprochement with Russia is now a core policy objective in Berlin. Polls are already suggesting that Germans trust Russia under Putin more than they trust the United States under Trump. That is some amazing 4D chess President Trump is playing. It is also worth noting that Germany did not participate in Trump, Macron, and Theresa May’s grandiose attack on Syria in April this year. Perhaps Germany is seeing less and less in common with the US, and has less of an intention of waging war to see its interests met, unlike the US, which apparently sees violence as the logical solution to all its problems. Sheez. It should be no wonder that in this context, Germany has been secretly building a European Armyof its own, already announcing the integration of its armed forces with Romania and the Czech Republic, baby steps to creating a European army under German leadership.